Exotic items are getting a total overhaul. Upgrade materials are now purchasable with Vanguard and Crucible marks. The Templar can't be thrown off a ledge anymore. If you understand any of those sentences, you're probably addicted to Destiny, a video game in which players spend thousands of hours farming for relic iron. And you'll be pleased to know that Bungie just released a patch that will bring a whole lot of potentially game-changing tweaks to the polarizing shooter-MMO. Including one that could prevent us from ever again spending thousands of hours farming for relic iron. Check out Bungie's site for the full patch notes, which mostly revolve around how Exotic weapons and armor have changed. Almost every Exotic weapon has gotten a tweak or a buff. Also, instead of upgrading Exotics with regular ascendant materials, you'll now have to use a new item called Exotic Shards, obtainable from Xur or by dismantling an old Exotic item. Huge. HUGE. 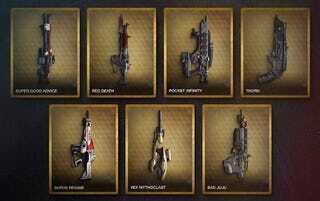 If you're not psyched about the fact that we might not have to grind as much for materials anymore, then, well, you haven't played Destiny.